My little guy is finally here! Well you know I've been taking it easy the last couple months and have been a bit absent from my lil blog. My little guy is finally here and I'm feeling so blessed that I get to spend my days...and nights :) with these three! Thank you for your continued support and for stopping by! Enjoy! Our little guy's room is done! Hooray! I absolutely love how it turned out! My husband even loves it and I've found him in there just relaxing in the chair :) Not quite sure what you'd call the theme, but I call it Rustic Beachy Nautical. Yeah I know beachy is not even a real word, but that's the best I could come up with :) Stay tuned for posts about all the DIY projects: compass pillow, striped pillow, vintage canvas map, number canvas, oars upgrade, twine initial, faux basket liner and bedding. Enjoy! Well I'm finally getting around to posting the gifts I made for Mother's Day! I've been spending as much time with my girlies as possible and doing projects like crazy getting things ready for our little guy...by the way he's scheduled to arrive in 9 days, but have been so lazy about posting on the blog! Forgive me? I hope so! So let's get back to the post! These are so easy, so cute and were a huge hit! It took a trip to the dollar store for 2 glass candle stick holders and 3 plates. Combine that with E6000 glue and you're ready! Clean and remove all stickers from plates and candle ticks. Let completely dry. 3. Repeat step 2 and let those dry overnight. 5. Put it in a safe place and let it dry overnight﻿. And you're done my friends! Simple right? YES! Even my husband loved it and asked if I was making one for us :) of course I was! You may have noticed it on my buffet table when I shared that makeover with you. It was a huge hit and would also make a great gift for a wedding or birthday! I had so much fun planning this birthday party! It was a lot of work, but so worth the look on my daughters face when she woke up the morning of her birthday! If you know me you know I don't like to just buy the store printed table clothes and call it good for decorations. I wanted the sun banners and lanterns everywhere. There was a very helpful blog I came across with ideas that I liked and she even included some printouts! *If you would like printable versions of the coloring pages (found in google search), sun bunting (found here), lanterns, Flynn Rider wanted poster (found in google search) and frying pans I'd be happy to email them to you. Please contact me at lilpinkpocket@gmail.com. Now lets get to the party! I made the sun buntings by stringing them on yarn and adding fabric scraps in between each one. I made lanterns by printing the design on vellum and put battery operated candles inside. The hanging lanterns have the candles attached by fishing line. The "hair" is made from crape paper. I cut 9 strands 23 feet long, braided 3 sets and then braided those three together...yes it was time consuming, but once I got my groove it went by a little bit quicker! The cake turned out to be my favorite part! If you know my you know I'm horrible at cakes so this was a very proud moment for me! I saw this tower using ice cream cones and I can't find where it is! I used a glass platter for the base and put the first layer of frosted cupcakes. Add the next layer of frosted cupcakes (about 8) The actual tower is 2 regular cones hooked together with skewers, a cupcake and a frosted waffle cone on top. Then add the green frosting to look like leaves and vines up the tower. Then add the flowers (from the dollar store) and that's it! My little Rapunzel all dressed up and so excited for the party! We had and assortment of food that was geared towards the movie as well. Braided bread sticks, yellow twizzlers and jello and orange boats. For entertainment at the party I had coloring pages for when people started getting there, we played pin the frying pan on Flynn Rider and painted pillow cases. It was so much fun and a huge hit with my 4 year old! 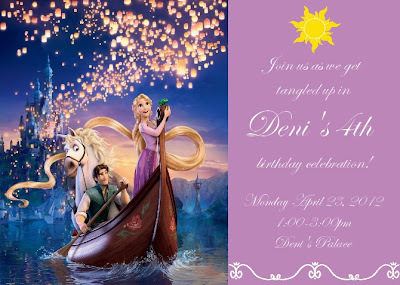 *If you would like printable versions of the coloring pages, sun bunting, lanterns, Flynn Rider wanted poster and frying pans I'd be happy to email them to you. Please contact me at lilpinkpocket@gmail.com.